Bowed retaining rings act as a spring once they are properly installed into a groove. This main benefit allows the bowed retaining rings to compensate for accumlated tolerances. Generally when parts are manufactured, it is difficult to make them to exact precise dimensions. Bowed rings help to correct the “play” that occurs on the shaft by acting as a spring that keeps compression. Arcon Ring offers the best and most reliable bowed retaining rings in the industry. We can accommodate most every size to your exact specifications. 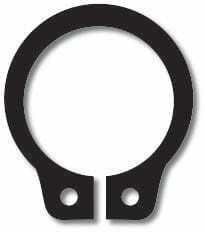 Other external retaining rings we offer include Standard, Bowed, Heavy Duty Push-On, Heavy Duty Standard and Grip. Contact us today!